There was a time when if someone said “Bentley” to me, an image of an old man smoking a cigar behind the wheel a big rolling box would come to mind. This, to me, epitomized Bentley. Until now. 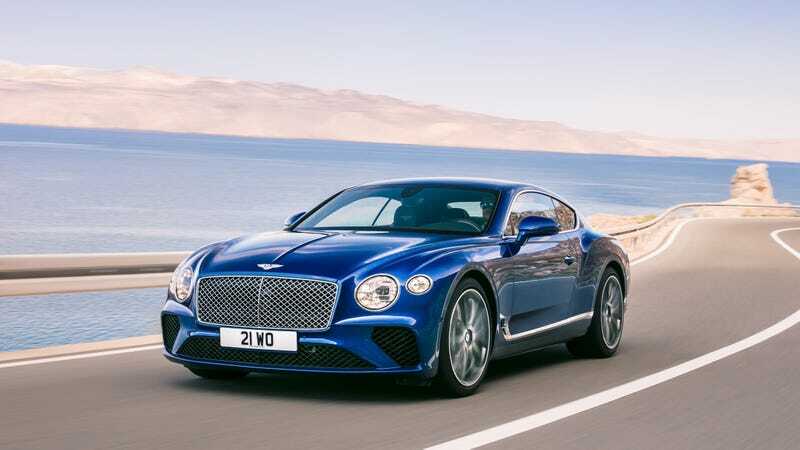 This is the all-new Bentley Continental GT and it is, in my opinion, the best-looking modern Bentley to date. It looks sleeker, lower and more aggressive. Anything that moves the design away from a flying brick is good with me. The third-gen Conti GT is still powered by a 6.0-liter twin-turbo W12, good for 626 horsepower and 664 lb-ft of torque. It’ll go zero to 60 in a claimed 3.6 seconds with a manufacturer-set top speed of 207 mph. But the major upgrade here is that the car has been fitted with an eight-speed dual-clutch gearbox. It has start/stop technology and a variable displacement system turns off half of the engine during certain conditions for better fuel economy. There’s all-wheel-drive (of course) with a 40/60 torque split between the front and rear wheels. Are the interior options are opulent as always? You bet: buyers can choose between 15 different shades of dead cow skin and carpeting. No pricing accompanied this initial release, but if I were to hazard a guess, I’d say it’s Expensive. Capital E, Expensive. But whatever, here are some pretty pictures.